← Christchurch, New Zealand. June 13th, 2011. Palm Jumeirah, Dubai. June 14th, 2011. A taxi fell into a sinkhole on the Palm Jumeirah yesterday morning that authorities say was caused by a ruptured underground water pipe. The hole, about three metres across and one-and-a-half metres deep, appeared between buildings six and seven in the Golden Mile and was full of water when the car plunged into it. 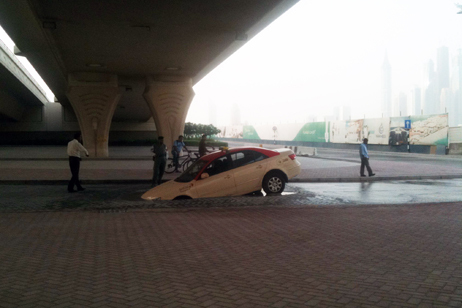 Dubai Police sent a rescue squad to remove the driver from the taxi, then the taxi from the sinkhole. Workers from Wade Adams, a development and construction company, were at work repairing the ruptured pipe and filling in the hole soon after the incident. Joining them were emergency responders from a gas company, checking nearby gas lines for damage. “The broken water main caused the sinkhole,” said Ahmad Fanari, a Wade Adams engineer. “The Palm is built on sand, and where the pipe burst, the sand was washed away, weakening the roadway. The area was flooded so the sinkhole was not visible. Wade Adams engineers said repairs would be completed by tomorrow morning. This entry was posted in Pictures, Vehicle v Sinkhole and tagged Dubai sinkhole, Palm Jumeirah, Palm Jumeirah sinkhole, sinkhole, sinkhole v taxi, taxi, taxi vs sinkhole, UAE, water main. Bookmark the permalink.